My brother Brendan popped around for a visit last weekend. 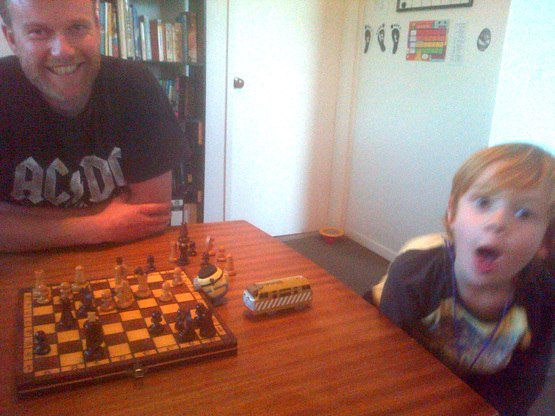 While he was here, we had a game of chess over a cheap bottle of chardonnay. 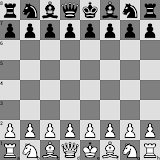 I was getting pushy at the start, and commented around move 9, "All this just to get a bishop?" He replied, "Oh yeah, I'd better take it then," and then I realised the trouble I was in - I had no way of saving my queen. My own 9th move should've been to shift my white-square bishop to another square (a few options seem good), so that it was guarding the square it had vacated, preventing the knight from going there. I can't quite recall the sequence of moves after this, but I somehow managed to even things up, and eventually I was actually better off coming into the endgame by having a rook to his knight (and a few pawns each). A silly hasty move saw me accidentally sacrificing the rook for no gain, and it was soon all over.